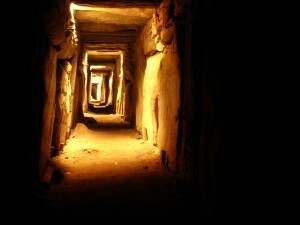 In the summer of 2011, I visited the Irish passage tombs at Knowth and Newgrange. These enormous construction projects are over five thousand years old, older even than the Egyptian pyramids, and they most likely took several generations to build. Each tomb is a mound of earth supported by massive stones. In the largest mounds, a passage penetrating the side leads to an inner chamber, where the cremains of the dead were once laid. Mysteriously, around four thousand years ago, the builders of these mounds sealed the passages up and left the area. * In Irish legend, the mounds became passages between worlds, places where one could enter the realm of Faery. I love the idea of discussing Pagan theology at (or in, or on) a mound. For contemporary Pagans, the idea of entering a faery mound calls up the search for inner wisdom or communion with the primal powers of the land. The interior of a mound is a liminal and sometimes dangerous place to which one may return many times: either in search of new knowledge, or to make or strengthen relationships with spirits or deities. Yet the purpose of entering the mound is not to remain, but to return to the surface changed. Interestingly, mounds are also places from which to survey the human realm. Atop the passage tomb at Newgrange, the view extends for miles: rolling hills, vividly green grass, the occasional sheep, and in this day and age, knots of colorfully dressed tourists. The mound provides a place of slight remove from the bustle of daily life, a windy perch from which one can gain perspective. The value of the mound is not just the chthonic journey below, but also the climb to the high places, places of clarity from which one might begin to speak. In naming this blog “Sermons from the Mound,” I have all the puns you can think of in mind (yes, even that one). But I also want to invoke the idea of oral culture, in which knowledge was performed rather than simply being written down. Many Pagans dislike the entire idea of religiously-oriented public speaking because the word “sermon” is associated with a certain kind of Christian speech act: an exposition of dogma, given one-to-many. Yet discussion and argument are key parts of speechmaking in oral cultures. Jesus’ “sermon on the mount” would have been a collective exploration of religious understanding facilitated by a knowledgeable teacher. That’s the kind of environment I hope to create, both here and in every classroom (in-person or virtual) where I gather with people earnestly seeking understanding. It has often been said, usually by Pagans themselves, that there is little in the way of contemporary Pagan theology. Our theology is in a nascent stage, it’s true; and it’s also true that contemporary Pagans tend to emphasize practice over belief. But we are not entirely lacking in theology, nor is theology inappropriate to Paganism. Theology arises at the interface of belief and practice, where belief informs practice and practice in turn inspires belief. Theologizing is an active process, something that every practitioner does, consciously or otherwise. Although many Pagans may be inclined, as Craft teacher Victor Anderson said, to “perceive first, then believe,” we do indeed have beliefs: models of ourselves, the world, and divinity in many forms. These models influence how we live our lives. This blog will explore contemporary Pagan theologies (because in such a diverse movement, how could there be just one? ), as well as related views such as queer, feminist, and ecological theologies from other religious traditions. Along the way, I will also review books and essays on Pagan theology and scholarship and respond to literature and current events from a body-centered, Pagan theological perspective. For me, the mound is an image that potentially unites two expressions of Paganism: both the inner journey into the dark, and also the story of that journey, shared with like-minded others as we sit in the sun-warmed grass. And though I would much rather have you join me physically on an Irish mound, I invite you to stop here a while to discuss your travels, to speak of practice and belief and the process that joins them. * This departure may have coincided with an event, perhaps a volcano eruption or similar, that dimmed the light of the sun and stunted plant life for about a decade. From what I understood from my tour guide at Newgrange, researchers have based this theory on evidence from the fossil record.